This entry was posted in Cloud, Computer, Murmuring, Network, Service and tagged digitalocean, heroku, hosting, nanobox, paas, platform, service, vps on April 12, 2019 by Gea-Suan Lin. Dedicated instances are optimized for workloads where consistent performance is required or where full-duty work (100% CPU all day, every day) needs doing. 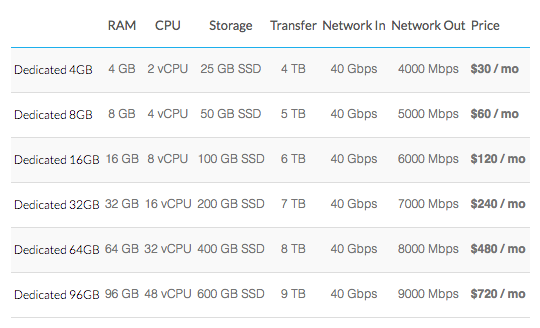 This entry was posted in Cloud, Computer, Hardware, Murmuring, Network, Service and tagged cost, cpu, dedicated, hosting, instance, linode, pricing, vps on February 6, 2019 by Gea-Suan Lin. Yahoo! acquired Ludicorp and Flickr in March 2005. The acquisition reportedly cost $22 million to $25 million. This entry was posted in Computer, Murmuring, Network, Service and tagged account, flickr, hosting, image, photo, pro, service, smugmug, yahoo on February 4, 2019 by Gea-Suan Lin. This entry was posted in Computer, Murmuring, Network, Service and tagged box, end, hosting, kvm, low, lowendbox, openvz, vps, xen on January 7, 2019 by Gea-Suan Lin. This entry was posted in Cloud, Computer, Murmuring, Network, Service and tagged digitalocean, hosting, k8s, kubernetes, vps on December 13, 2018 by Gea-Suan Lin. This entry was posted in Computer, Murmuring, Network, Programming, Service, Software and tagged alpha, bitbucket, control, git, github, gitlab, hosting, ht, js, performance, service, sr, system, version on November 17, 2018 by Gea-Suan Lin. This entry was posted in AWS, Cloud, Computer, Murmuring, Network, Service and tagged amazon, aws, chief, chunghwa, cloud, colocation, connect, direct, hosting, idc, taipei, taiwan, telecom on August 29, 2018 by Gea-Suan Lin. This entry was posted in Computer, Murmuring, Network, Service and tagged address, amazon, aws, hosting, ip, ipv4, ipv6, lightsail, vps, vultr on August 29, 2018 by Gea-Suan Lin.